I have to admit, it’s taken me a while to warm up to decentralized exchanges. Decentralized money I understand, but decentralized exchanges? I just didn’t see the added value. Bitcoins and other cryptocurrencies operate on a decentralized structure, with payments verified by the public ledger called the blockchain. The blockchain itself is maintained by thousands of distributed users devoting computer resources to the ledger, with each one confirming a new block of transactions every ten minutes. The process removes double spending, as computers confirming new activity on the blockchain would reject a payment if their ledgers should the money had been spent earlier. Using the same process, decentralized exchanges have been created. Among them include Mastercoin, Counterparty, Nxt, as well as Colored Coins (different than the previous three, but having the same concept). The basic idea is that I can designate a digital contract to be backed by an asset and then sell that asset on the exchange. For example, I have 100 shares of Apple. I then designate 100 Counterparty where each one is worth 1 of my shares of Apple. On Counterparty, I can now sell these 100 shares of Apple. The same process can be used for borrowing money and issuing IOUs, selling equity in a startup, or converting currencies. What is the need? – Centralized exchanges are already very efficient and the capital markets system is highly commoditized. For example, commissions on stocks continues to drop, with no-fee models being introduced in the US. Also, while it is true that cross border stock purchases are more costly, there remains very little demand for such trades, and low commission alternatives exist such as at InteractiveBrokers. Liquidity – A central role of an exchange is to provide liquidity to assets available for trade as well as offer a venue for raising funds from the public. Without volumes and proper liquidity, an exchange is worthless. To replicate this liquidity for traditional assets on a decentralized exchange is immensely difficult. The quickest way to launch a new exchange is to provide equity to market makers where it will then be in their best interests to provide liquidity. How would this work with a decentralized exchange? Scams: This is what I am most concerned about. Mastercoin uses a ‘proof of trust’ (my words) concept which is based on issuing how much you are willing to trust other users. However, even with such a model, a decentralized exchange would most likely attract scammers selling fictitious assets and IOUs, gaming ratings systems to gain trust of the exchange. Despite my hesitations with decentralized exchanges, where I believe there is a tremendous opportunity it with crowdfunding and crowdequity. Thanks to KickStarter and other firms, crowdfunding as a platform for raising funds to launch new products, books, and movies has become a multi-billion dollar industry. Where they fall short though is their ability to award the early backers who were willing to assist the crowdfunding campaign. Yes, they get the product first, but they are unconnected to any future profits that the campaign may be the fruits of. As primarily being consumers, there hasn’t been much of an expectation that crowdfunding participants should be entitled to future profits of company that launches to fame on KickStarter or IndieGogo. However, that mindset changed a bit after KickStarter phenom, Oculus VR was purchased by Facebook this year for $1.6 billion, while early adopters that were willing to fork over a not so small $300 figure having no stake in the buyout. What if Oculus had set aside 5% of its equity to the first 5000 buyers? Using a decentralized exchange, Oculus could have bought and distributed digital equity contracts to its buyers. Similarly, how about crowdfunded arts campaigns that go towards the production of a movie or writing of a book include participants to gain equity in the potential profits of the finished products? 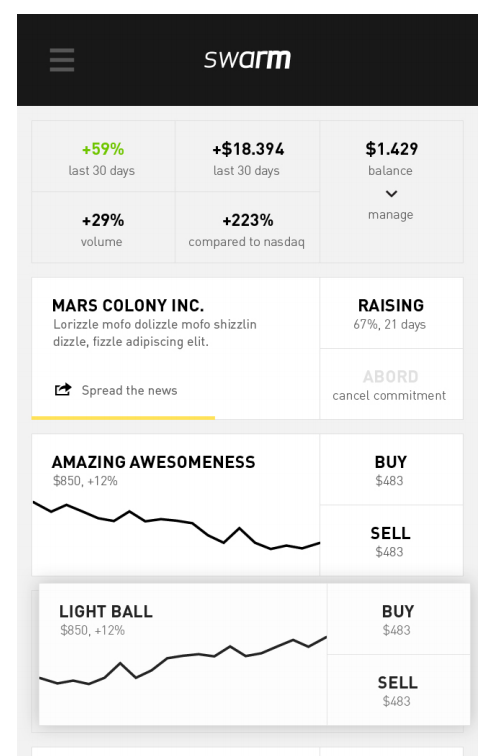 Going public last week is Swarm, a new digital currency crowdfunding platform. Built using the Counterparty protocol, users can use Swarm to issue coins, which they can sell on the platform to raise funds for their crowdequity campaign. 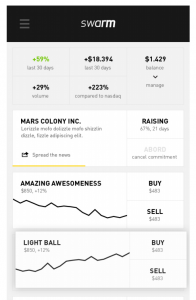 By putting their emphasis on crowdequity, Swarm is aiming to change the process at which companies raise money, using their decentralized exchange. Much of the platform is at the minimum viable product and development level, with a crowdfund app slated to be created to allow for easy monitoring and investing in new offerings. In addition, Swarm is working on a review method to provide a level of filtering and due diligence to be applied to the platform. While the idea and interface provides and innovative take on crowdfunding, what is really worth watching is how the firm maneuvers the legalities of raising equity. In the US, crowdequity is currently only available to accredited investors. In addition, companies selling equity this way need to fill out proper documentation. Bitcoin based equity offerings have already caught negative attention from the SEC in the US. Lawyers are also around to dot the i’s and cross the t’s of any contract, with every equity offering having its own set of customizations. However, when it comes to creating solutions for problems, crowdequity and crowdfunding using Swarm or other decentralized exchanges provides an efficiency that can’t be denied.